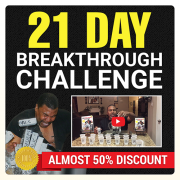 Can’t wait to go through the “21 Breakthrough Challenge” interactive videos, and an honor to get them for just $49.95, and to promote them to team members and prospects to get them to explode their business. I made Global Ambassador in less than a week without emailing a large database etc. I used my principles that I teach in this series along with principles that I teach in my book “How To Build A Big Team Fast” I’m honored to be your mentor, Coach or Trainer! 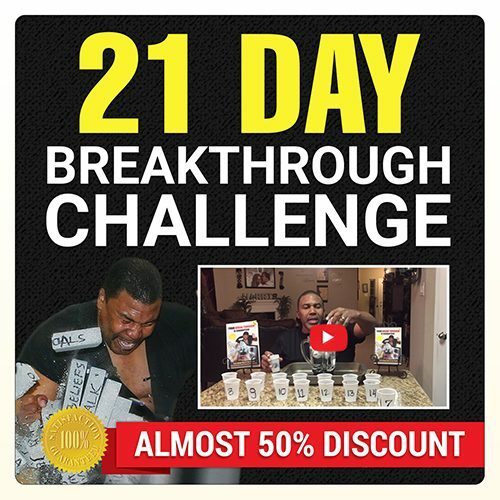 The Breakthrough Challenge is awesome, not only did I take and enjoy it, I got several of my friends to take it. Wow…… is the first thing that comes to mind in reference to the 21 Day Breakthrough Challenge. So many lives have been changed including myself. The Breakthrough Challenge has become a lifestyle for myself and my husband. From learning to leverage your skills and abilities to learning to use your words to create an atmosphere that is conducive to a breakthrough. This challenge is locked and loaded with information that will transform your life. This Challenge changed my life! I even fasted 19 days with Dr. Breakthrough and received a financial Breakthrough, mental, spiritual and Relationship Breakthrough. Everyone needs to take this course asap! I have known Dr. Stan aka Dr. Breakthrough for many years and have experienced Breakthroughs from his preaching and teaching. I highly recommend everyone take his challenge asap. You will be glad that you did! Dr Breakthrough is the best, take his training now! This challenge will change your life. I love Dr. Breakthrough’s teachings! Dr. Breakthrough has helped me get many breakthroughs. Everyone should take the challenge! I have taken the challenge 3 times! It got me to Ambassador! Everyone should take it at least once!